The Myldred Fox Fairchild Alumni House was designed to be a home away from home for alumni while they are on campus. 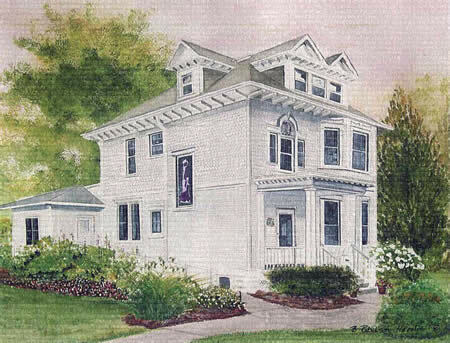 The house also serves as a hospitality center for visiting alumni and dignitaries; a guesthouse for prospective students, their families, alumni, and other campus visitors. The house is named in honor of long-time alumni secretary Myldred Fox Fairchild. With the exception of a few circumstances, reservations will be taken for individual bedrooms as opposed to the house as a whole. Kitchen, living room, conference room, and other common areas are shared by all occupants. Reservations are made through the Alumni Office by calling 573.592.4220 or emailing alumnihouse@williamwoods.edu. Reservations are made on a first call, first availability basis with alumni being given first preference. The house is a self-supporting facility available at $50 per night for each bedroom. Prospective students and their family members may stay as guests of the university for one night. Additional nights are available at $50 per night for each bedroom. Guest parking on 12th Street near the Alumni House is very limited. There are parking lots behind and to the east of the Alumni House (beside Bartley Hall).